Just as Linsanity was peaking, along came the NBA all-star break, when the top players get to show off in a different way. The New York ballet world is undergoing a sort of all-star break itself in the wake of NYCB's winter season. Of course, it's not like NYCB or ABT's dancers are lounging around eating bon bons... they tour between NY seasons, or dance with other companies, so the break, or vacuum, is really for us. Last weekend, the 2012 Kings of the Dance—Opus 3—performed at City Center. 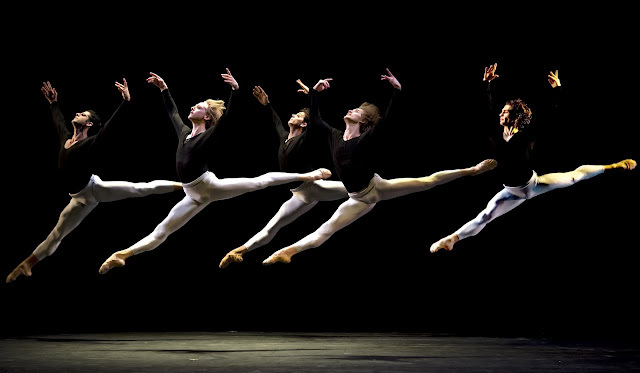 This year’s lineup included ABT’s Marcelo Gomes and David Hallberg (also, Bolshoi), Guillaume Côté (National Ballet of Canada), Denis Matvienko (Mariinsky Ballet), and Ivan Vasiliev (Mikhailovsky Ballet, and until recently, the Bolshoi). The point of this Ardani Artists project, like many in its portfolio, is to allow ballet to fiddle around and experiment with contemporary styles, and to explore other aspects of physical and emotional expressiveness. The main drag on this program is that the curatorial taste leaned on a certain genre of European, neurotic gesture-heavy contemporary ballet. At the end of the evening, Mauro Bigonzetti (whose work Jazzy Five comprised the first half), Marco Goecke, Patrick de Bana, and Edward Clug’s vocabularies unfortunately blended together in the mind—a mixture of twitches, cause-and-reaction limb work, and dramatically lit musculature. Even these admittedly fantastic dancers found little in this material to make memorable, although both Hallberg and Gomes worked best in their Bigonzetti solos, taking the task to heart, and Vasiliev blasted off earth in his leaps. A nice surprise—Gomes choreographed KO’d, the appealing finale, set to a symphony composed by Guillaume Côté. Gomes basically hewed to a classical vocabulary, which seemed to relax and liberate the men. Côté exited after a group section and emerged playing the piano for a brief time. (Too bad these guys have no skills.) An easy collegiality made for an uplifting ending on a bill that could have used some more aesthetic variety. 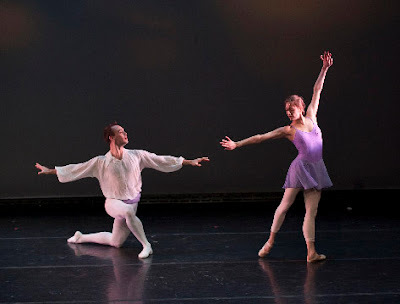 On Monday night, Tom Gold Dance presented a compact program on the ultra-compact stage at Florence Gould Hall. This ex-NYCB soloist put together a ridiculously gifted cast including current principals Sara Mearns, Tyler and Jared Angle, Robert Fairchild, and Abi Stafford (all from NYCB), and the rising star soloist Simone Messmer at ABT. They performed four of Gold's dances which varied in tone and musical genre. The opening group dance, filled with coy touches, was set to Asian-like music by Alexandre Desplat. Three lovely duets to Romantic piano music (played live), danced poetically by Messmer and Tyler Angle, showed Gold's knack with creating interesting finishes. Three couples performed the more classical Mozart Variations; Stafford, of smaller build and refined features, especially shone in this close context. The ensemble crammed onstage for Tango Fantasie, in which Fairchild showed his magnetism and cool style, and partners Tyler Angle and Sara Mearns smoldered. Of course, we want to see this caliber of performer as much as possible, but it was hard to see the dance for the dancers. No doubt the performance was meant to entice further support for future programming on a larger stage, a chance Gold certainly merits. Especially if he can assemble all-stars like this.